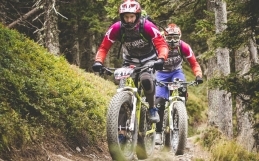 The Most Epic-est Mountain Bike Trail Ever ? The Most Epic-est Mountain Bike Trail Ever ? THE MOST EPIC-EST MOUNTAIN BIKE TRAIL EVER ? Video by Chris Saint-Aubin – Mont Charvet (2,538 m) in the Aravis Range in Savoie, France. I love the trail I just don’t know if I was brave enough to ride it.